Nagavara Ramaroa Narayana Murthy, fondly called NRN or Narayana Murthy, the co-founder of Infosys Technologies is renowned as the Father of Indian IT Industry. He was born on 20th August 1946 in Kolar district, Karnataka. He played a very prominent role in nurturing Infosys and helped in shaping up a position for Infosys in the giant IT World. His dedication, values, principles were extremely simple and down to earth. NRN is an epitome of simple living and high thinking. 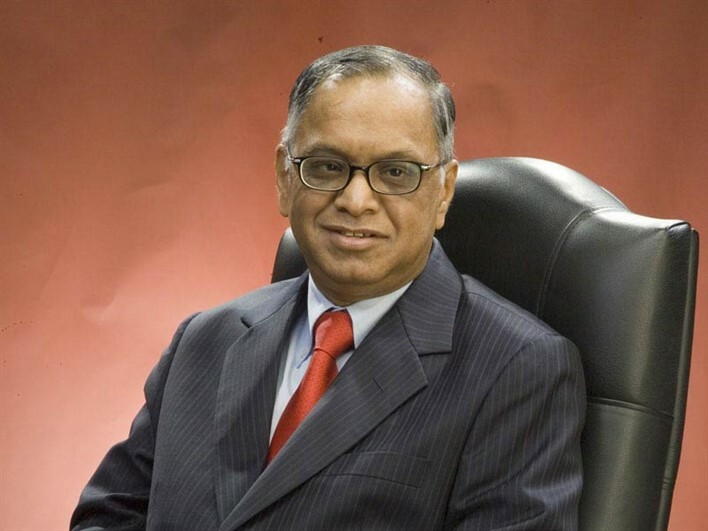 Murthy has been enlisted in the top 12 greatest entrepreneurs by the Fortune Magazine. He was with Infosys for a long time and now continues to be mentoring them with the same dedication he had put in to bring forth the company. Born in Siddhaghatta, Kolar in Karnataka, after his school education he pursued his engineering in National Institute of Engineering and graduated from there in 1967, with a degree in Electrical Engineering. Again, he acquired his masters from Indian Institute of Technology in Kanpur in 1969. After completing his education, he moved to London, where he worked in a company called SESA for 3 years. While working with SESA he excelled in designing software for air-freight management at the Charles De Gaulle terminal in Paris. This was when he decided to return to India to start his own company. In 1976 he joined IIM Ahmedabad as the chief systems. He initiated a small IT software consulting firm in Pune, but the company failed and he joined Patni Computer Systems later. The failure of the startup was like a learning experience for him. That was a time when he met his soul mate Sudha Murthy who offered him a helping hand in investing for the company he wanted to start with. Finally, in 1981, Infosys was founded, where his life began to change. Along with him, were 6 other software professionals who joined him to start Infosys. Infosys flourished in the IT industry with the proper guidance and hard work that these professionals and NRN had put in. Even after retiring from the service after serving the company for years, NRN has always being a part of the organization as a Mentor. His values and suggestions always kept Infosys stronger in the IT world. His individual contributions in pioneering the IT sector have always brought him numerous recognitions and honors. From the year 1981- 2002, he was serving as the Infosys CEO. He played a pivotal role in channelizing the outsourcing IT industry bringing in the global Delivery model, which many other IT giants are currently putting into use. His clear vision and hard work have always paved way for Infosys to reach greater heights. With more than 80,000 employees and numerous successful and happy clients, Infosys is reigning in the IT market. From 2002-2011 he served as Chairman for Infosys and later after a small break he began to continue to be a mentor for Infosys. NRN as successful as a head of IT giant Infosys also has a glorious personal life. He was married to Sudha Murthy, who is the pillar of his success. She herself is an epitome of Social Awareness and Women empowerment. She worked together with her life partner to nature Infosys. They have two kids Rohan and Akshata Murthy, who ae very well off settled in their respective chosen fields. NRN was honored with Padma Bhushan and Padma Shri and many other recognitions for the impeccable contribution he had done for the upcoming of Information Technology in India. Recently in 2016 he was awarded the Philanthropist of the year in the Asian Awards. Despite all these awards and honors, he has always shown the values of simple living. He is known for his down to earth nature and friendliness. His achievements and hard work are a great example for any other Indian who aspires to be an entrepreneur. His encouragement had led to the revolutions of startup industries in India.